The 10th Health China Forum, a domestic health industry-oriented forum organized by the People's Daily Online and Health Times, took place in Beijing on December 29. The domestic online-to-offline health service provider Beijing YS Health Technology Co., Ltd and the China Association of Chinese Medicine launched a project promoting online traditional Chinese medicine (TCM) services at the forum. 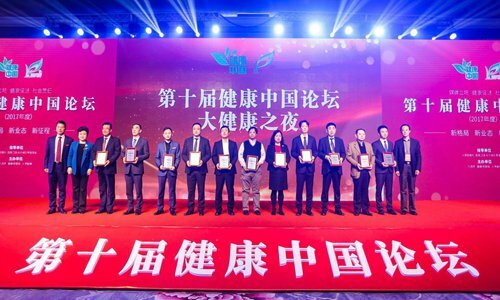 Beijing YS Health Technology Co., Ltd received an award in recognition of its achievements as a model organization for health promotion in 2017. Corresponding with the idea of promoting traditional Chinese medicine at the 19th CPC Congress, the project aims to promote TCM's value and capacity in disease prevention, rehabilitation and family health management. Some leading domestic industrial experts will offer online, offline or door-to-door health services to users. Established in December 2014, Beijing YS Health Technology Co., Ltd is a leading industrial company that merges an internet platform with health management solutions. With more than 600 full-time TCM masseurs and 200 TCM and rehabilitation doctors, they provide professional TCM services, including massages and physiotherapy, to more than 1 million users. Daily online orders surpass 2,000 with an annual income of 10 million yuan ($1.54 million), according to company statistics. Sun Jinzheng, the founder and CEO of Beijing YS Health Technology Co., Ltd, said his company spent three years on standardized research into 99 common illnesses and packaged services into four criteria: recognition of an illness, diagnosis, medical treatment and rehabilitation. "We also train all our service providers with a standardized approach so as to make sure our service quality is stable and well-managed," said Sun, noting that services include massages, postpartum recovery and rehabilitation for every family member. "In the past few years, the government has advocated for the concept of family doctors, but the fact is that every doctor needs to serve thousands of families, which makes it impossible to do the work," he said. "We will help family doctors in China manage their patients' data and offer professional help efficiently." For the TCM practitioner, collaborating with Beijing YS Health Technology Co., Ltd relates to the company's professionalism, explained Sun Yongzhang, vice secretary of the China Association of Chinese Medicine. Doctors can go to the client's door fully prepared to treat them, he said. "They have served millions of users from which they accumulated vast experiences and data," he said. "With our collaborative project, users can enjoy a customized health service."